Editor's note: A version of this story appeared in the latest edition of the Norwood News, out on streets now. Shane Barker, a 16-year-old University Heights resident, does not usually use Devoe Park, the triangular and hilly green space that sits on the corner of Fordham Road and University Avenue and is just blocks from his home. “Me and my brother don’t come down here because there’s troublemakers,” he says. But today is different. It’s a gorgeous, sunny Saturday morning and Shane, sporting cornrows and the wispy beginnings of facial hair, is one of 70 kids participating in a newly-formed basketball program created by a Bronx-based group called the New York City Christian Athletic League. 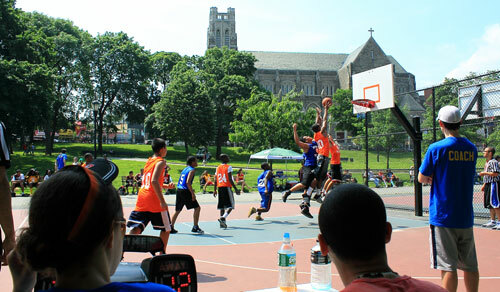 Aided by word of mouth and an infusion of funding from local Councilman Fernando Cabrera, the hoops program is flourishing in a park that has become synonomous with trouble. The league’s founder, Edwin Santiago, and his “right-hand man,” Frank Abarca, both attend Bronx Household of Faith, an evangelical Christian church that meets at PS 15/291 on Andrews Avenue in University Heights. In 2005, Santiago, who lives in Soundview and works part-time at Horace Mann, started a men’s softball league that has grown to the point where it now includes 10 other city churches. He wanted to expand the league to include youth leagues, but only recently decided to take “a leap of faith” and go for it. He started with football at Harris Field last fall, eventually growing the program to include close to 50 youngsters between the ages of 12 and 18. “It’s very organized and professional,” Shane says. After some exercises and stretching, players meet with their coaches for “devotional” time, where players talk about life and religious lessons. “We teach them how to be a good Christian, be a godly man,” Abarca says. Although their church is evangelical and Christian values are preached before and during games, Santiago says the league is accepting of all faiths. “We have players from all religions here,” he said. Abarca says devotional time is dedicated to learning “universal values” like respect and accountability. Nice article about something good happening in the Bronx. Wow. Interesting that the 2nd Circuit just ruled yesterday that this Bronx Household Church that is actually doing some good in the community can't meet at PS 15/291 anymore. The school policy prohibits "religious worship services" in the buildings now. Maybe the city should re-think who they're kicking out. Too bad Council Member Koppell does not sponsor or provide the resources for a "hoops program" or a volleyball league to get players off the Mosh. onto appropriate "grounds" in his district. This is a great article. Its Great to see something happening for the kids in the bronx. Keep up the good work. Congratulations, initiatives developed by you are teaching good values like cooperation, teamwork and, the fact that adults organize and supervice this activities contribute to avoid conflict among them while they reinforce the religious values. My sons are taking part in the action and I feel proud of it. I really like that.